Ahmed Hussein Deedat (July 1, 1918 – August 8, 2005) (Urdu: احمد حسين ديدات) was a Muslim writer and public speaker of Indian South African descent. He was best known for his numerous inter-religious public debates with evangelical Christians, as well as pioneering video lectures, most of which centered around Islam, Christianity and the Bible. He also established the IPCI, an international Islamic missionary organization, and wrote several booklets on Islam and Christianity which were widely distributed by the organization. He was awarded the prestigious King Faisal Award in 1986 for his 50 years of missionary work. One focus of his work was providing Muslims with theological tools for defending themselves against active Proselytizing by Christian missionaries. He used English to get his message across to Muslims and the non-Muslims in the western world. 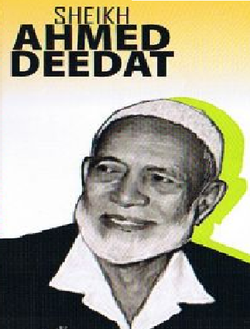 Ahmed Deedat was born in the town of Tadkeshwar, Surat District, Gujarat, India in 1918. His father had emigrated to South Africa shortly after the birth of Ahmed Deedat. At the age of 9, Deedat left India to join his father in what is now known as Kwazulu-Natal. His mother passed away only a few months after his departure. Arriving in South Africa, Deedat applied himself with diligence to his studies, overcoming the language barrier and excelling in school, even getting promoted until he completed standard 6. However, due to financial circumstances, he had to quit school and start working by the time he was the age of 16. Deedat took a more active interest in religious debate after he came across a book entitled "Izhar ul-Huqq" (Truth Revealed), written by Rahmatullah Kairanawi, found while he was rummaging for reading material in his employer's basement. This book chronicled the efforts of Christian missionaries in India from a century earlier. The book had a profound effect on Deedat and led to the purchase of his first Bible and holding of debates and discussions with trainee missionaries, whose questions he had previously been unable to answer. His foray into Bible Studies took a more serious turn when he started attending Islamic study classes held by a local Muslim convert named Mr. Fairfax. Seeing the popularity of the classes, Mr. Fairfax offered to teach an extra session on the Bible and how to preach to Christians about Islam. Deedat and a few others were delighted at the opportunity. However, only a few months into the project, Mr. Fairfax had to pull out of his engagement, and Deedat, who was by this point quite knowledgeable about the Bible, took over teaching the class. Which he did for three whole years thereafter and later credited for expanding his horizons significantly towards missionary work. Deedat's first lecture, entitled "Muhammad: Messenger of Peace", was delivered in 1942 to an audience of fifteen people at a Durban movie theatre named Avalon Cinema.. Over time, Deedat's popularity as a public speaker grew in Durban, to the point that he was invited to speak in other cities in South Africa. A decade later he was filling City halls with audiences numbering in the thousands in cities such as Johannesburg and Cape Town. A major vehicle of Deedat's early missionary activity was the 'Guided Tours' of the Jumma Mosque in Durban. The vast ornamental Jumma Mosque was a landmark site in the tourist friendly city of Durban. A sophisticated program of luncheons, speeches and free hand-outs was created to give an increasingly large number of international tourists often their first look at Islam. Deedat himself featured as one of the guides, hosting tourists and giving succinct introductions to the Islamic Religion and the relationship between Islam and Christianity. By 1956, missionary work in the form of frequent public speaking engagements and the popular guided tours of the Jumma Masjid had begun to pay dividends. Enquiries about Islam from the general public in South Africa had started to pour in at an increasing rate. Soon it became apparent that working from the mosque office was not going to be sufficient to handle the demand for literature and to facilitate an increasing number of people showing more than simply tourist level interest in Islam. Among Deedat's close friends were Goolam Hoosein Vanker and Taahir Rasool, whom many refer to as 'the unsung heroes of Deedat's career'. In 1957, Deedat, together with Vanker and Rasool, founded the Islamic Propagation Centre International (IPCI) with the aim to print a variety of books on Islam and offer classes to new Muslims converts. In 1958, Deedat also established an Islamic seminary called As-Salaam Educational Institute on a donated 75-acre piece of land located in Braemar in the south of Natal province. With these newly founded missionary organizations as his backbone, Deedat engaged into a broader range of activities over the next three decades. He conducted classes on Biblical Theology and conducted numerous lectures.Da`wah (inviting people towards Islam) became the dominant factor of his life, with audiences at his lectures often reaching in excess of forty thousand. He also wrote a large number of booklets, distributing millions of copies of these and other free literature across the world. Pakistan, where Deedat met Zia al-Haq, UAE and Maldives Islands (Nov–Dec 1987), where Deedat was honored by President Gayhoom. On May 3, 1996, Sheikh Ahmed Deedat suffered a stroke which left him paralyzed from the neck down because of a Cerebral Vascular Accident affecting the Brain Stem, and which also meant that he could no longer speak or swallow. He was flown to King Faisal Specialist Hospital in Riyadh, where he was reported to be fully alert and hence taught to communicate through a series of eye-movements via a chart whereby he would form words by acknowledging individual alphabets read out to him; this way he would form complete sentences. He spent the last nine years of his life in a bed in his home in Verulam, South Africa, encouraging people to engage in Da'wah (Islam propagation). He was looked after by his wife, Hawa Deedat, and was reported to have no bed-sores. He continued to receive hundreds of letters of support from around the world, and local and international visitors continued to visit him and pay homage to his work. Deedat's memorable tussles with Palestinian-American missionary Dr. Anis Shorrosh first came to public attention when Shorrosh appeared among the audience during the Q&A sessions on two separate occasions during Deedat's summer 1985 tour of the UK (where he debated Dr. Floyd E. Clark in what is now considered another one of his early international works). Thereon ensued some back and forth between the camps of Deedat and Shorrosh and the result was two highly contentious debates, the first of which, entitled Is Jesus God? took place right away in Dec 1985 at the prestigious Royal Albert Hall in London. The second debate was organized with much fanfare and held in Birmingham, UK on August 7, 1988; entitled The Quran or the Bible: Which is God's Word. This debate spanned a total of 240 minutes including the Q&A session. Deedat's most famous moment came when he managed to land a debate with televangelist Jimmy Swaggart at a time when Swaggart was one of the leading faces of Evangelical Christianity. The debate entitled Is The Bible the Word of God?, was held in Swaggart's hometown of Baton Rouge, Louisiana in November 1986 at the University of Louisiana, where it was attended by about 8,000 people. In Ahmed Deedat's US tour of 1986, Deedat also debated Dr. Robert Douglas, PhD (Zwimmer Institute) at the University of Kansas in November 1986 in a debate entitled Crucifixion: Fact or Fiction. Deedat's last major debate entitled Was Jesus Crucified? took place at the Maple Leaf Gardens in Toronto, Canada on July 17, 1994 featuring Wesley H. Wakefield (Bishop General of the Bible Holiness Movement of Vancouver). Deedat published and mass produced over one dozen palm-sized booklets focusing on the following major themes. Most of Deedat's numerous lectures, as well as most of his debates in fact, focus on and around these same themes. Often the same theme has several video lectures to its credit, having been delivered at different times and different places. Capitalizing on his popularity in the Middle East following his receipt of the King Faisal Award, Deedat secured a grant to print a collated volume of four of his popular booklets. 10,000 copies of this book titled The Choice: Islam and Christianity were initially printed on April 1993 in a very high quality HB 'silk paper' edition with a striking burgundy cover with gold embossed title. This book was very popular in the 1990s, often available for free at missionary outlets across North America. Subsequently, several printing houses offered to print more and within two years, by June 1995, another 250,000 copies had been printed in several print runs across the Middle East. Later, a second volume in plain PB entitled The Choice: Volume Two featuring six more of Deedat's booklets collated together was also published. Deedat also widely promoted a South African printing of The Holy Qur'an translation by Abdullah Yusuf Ali with commentary and detailed index. This was widely made available at subsidized costs to the general public and is often mentioned in Deedat's speeches. Ahmed Deedat will be truly missed he is the new-age lion of Islam.may Allah be pleased with all his works and his life and grant him Janna(heaven).